Interfaces directly with any theremin. Eight octaves of pitch tracking through 14 bits of pitch bend data. Control over octave range down to 1 semitone allowing for glissando playing. Auto octave switching with control over octave and tone transpose. Built in MIDI merge facility to allow control of sequences with a theremin. External foot switch connection for Hold mode and patch change. CV voltage range and scaling, software adjustable. Two 1V/Octave voltage outputs with GATE and TRIGGER, 5/15V switch definable. The MIDI-Wave is a pitch & amplitude-to-MIDI & CV interface. There are 128 user patches which can be loaded from the front panel, foot switch or remotely via the MIDI program change message. Each patch contains detailed setup parameters including octave range, pitch bend range, amplitude sensitivity, velocity sensitivity, volume sensitivity, octave spread, tone offset, program change and more! A hold foot switch is available to allow a note to be held. 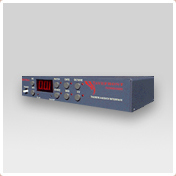 Two control voltage outputs are provided for pitch and amplitude. The gate and trigger signals are amplitude threshold switched, with control of the switch threshold. The source of the CV interface may also be switched to incoming MIDI to allow use as a standard MIDI to CV converter. The MIDI-Wave is capable of simultaneous Theremin-to-MIDI and MIDI-to-CV conversion. The pitch bend controller (1-48 semitones definable) is used in conjunction with RPN (54H) portamento control to follow the pitch of the theremin. Pitch is resolved down to +/-2.5 cents over eight octaves with 10 cents hysteresis (to reduce the amount of useless MIDI data transmitted from wobbly hand syndrome). The channel volume message is used to control the amplitude, and can be assigned to channel pressure (aftertouch), poly pressure and virtually any other MIDI controller. An echo back facility is provided in place of the MIDI THROUGH feature. This merges the Theremin MIDI data with incoming MIDI data, allowing for control of sequences with a theremin.